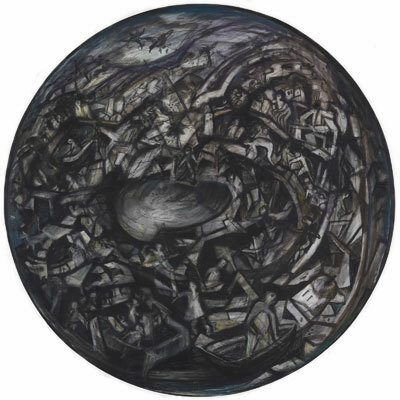 Friday 6 November 2009: It was announced today at the Art Gallery of New South Wales that Pam Hallandal is the winner of the 2009 Dobell Prize for Drawing for her work, Tsunami. Pam Hallandal was awarded $25,000 for winning Australia’s most important prize for drawing. This year there were 649 drawings entered, of which 46 are included in the exhibition. The winning drawing is an apocalyptic vision inspired by the 2004 Indian Ocean tsunami, a subject which has engaged Pam Hallandal in the years since. A swirling vortex of figures composed in a circle, this masterfully rendered drawing evokes the human drama of the cataclysmic tsunami in the oceans to Australia’s north. Pam Hallandal is a widely respected artist and teacher; this is the second time she has won the Dobell Prize. Hallandal won the prize in 1996, with Self portrait and judged the prize in 1999. Born in Melbourne in 1929, Hallandal studied sculpture at RMIT and at the Central School of Art, London. She subsequently taught drawing at the George Bell School and drawing, sculpture and ceramics at Prahran Senior Technical College, Melbourne for over thirty years. The Dobell Prize for Drawing, initiated by the Trustees of the Sir William Dobell Art Foundation, is an acquisitive prize, first awarded in 1993. This year the prize has increased in value to $25,000. This year’s judge was Melbourne artist Nick Mourtzakis. Mr Mourtzakis has won the Dobell Prize twice, in 2000 and 2006. He currently lectures in drawing in the Faculty of Art and Design at Monash University and his work is represented in state and national collections.